smothered quail | Is there any wine left? I have conquered a cooking mountain! I wrote in my “about katie” page that I have been trying to make smothered chicken that was as good as Zadie’s for a long time. Zadie was our maid when I was growing up and of all of the wonderful things she cooked, my favorite was her smothered chicken. She taught me how to make it when she was alive but I didn’t take notes and I am sure I didn’t pay as much attention as I should have, so I have never been able to replicate it. Or even get close. I really regret that. Momma found a recipe for smothered quail from Dunleith Plantation in Natchez and after a few tweaks, I think we have a winner. You could use this same method for chicken or pork chops. Here’s what you’ll need. Ignore the white pepper. It was on the counter so I threw it in the picture, but it was actually for something else. Where can you find quail? Well, if you’re like most of my friends, your husband is a hunter and you can find it in your deep freeze. Not that lucky? Check Whole Foods or call a local butcher. In Houston, Pete’s Fine Meats usually has quail. On to the recipe. Season the quail with the Tony Chachere’s. This isn’t super clear in the picture below (thank you iPhone camera) but you don’t want to completely coat the quail. Just a little sprinkling on each side. Set aside. Combine ¾ cup of the flour with the paprika, nutmeg, black pepper and thyme in a shallow dish. I like thyme so I went a little heavy on it here. Same with the black pepper. You can adjust these spices to you liking. But don’t leave out the nutmeg just because it sounds like a funny addition. It adds a nice warm undertone. Dredge the quail in the flour mixture. Heat the oil and 2 tablespoons of the butter in a large cast dutch oven over medium heat. Why oil and butter? Butter has a better flavor but oil has a higher smoke point so it won’t burn as quickly. 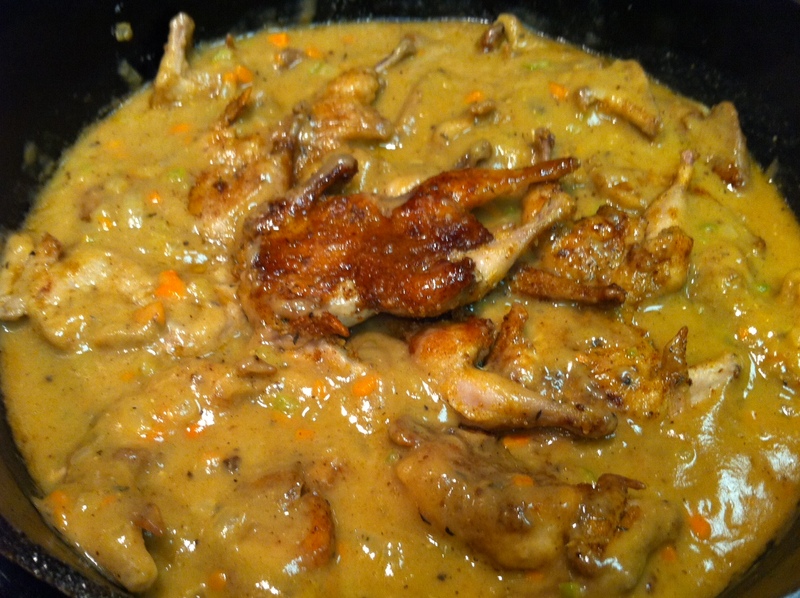 Fry the quail in the dutch oven until they are golden brown, turning them to cook evenly, about 6-7 minutes per side. Remove the quail from the dutch oven and set aside. Do not clean those delicious drippings from the pan!! Instead, add a stick of butter to the pan drippings in the dutch oven. 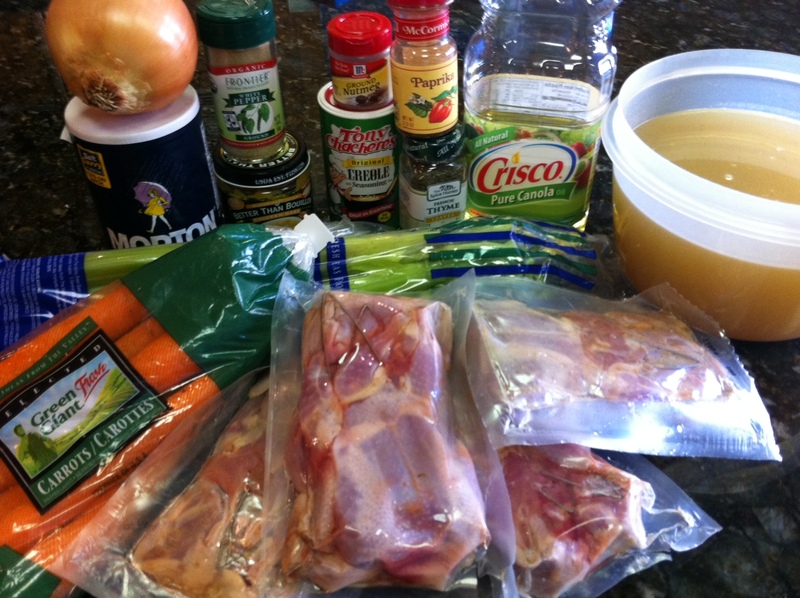 Once it has melted, add the onion, celery and carrots and stir until they are soft, about 5 minutes. Sprinkle the remaining 6 tablespoons flour over the mixture and stir until the mixture has browned, about 15 minutes. Gradually stir in the broth and continue stirring until the mixture is smooth. Add the wine and simmer, whisking, over low heat for 5 minutes. Add the quail and cover the pot. Simmer over low heat until the birds are very tender, about 45 minutes – 1 hour. 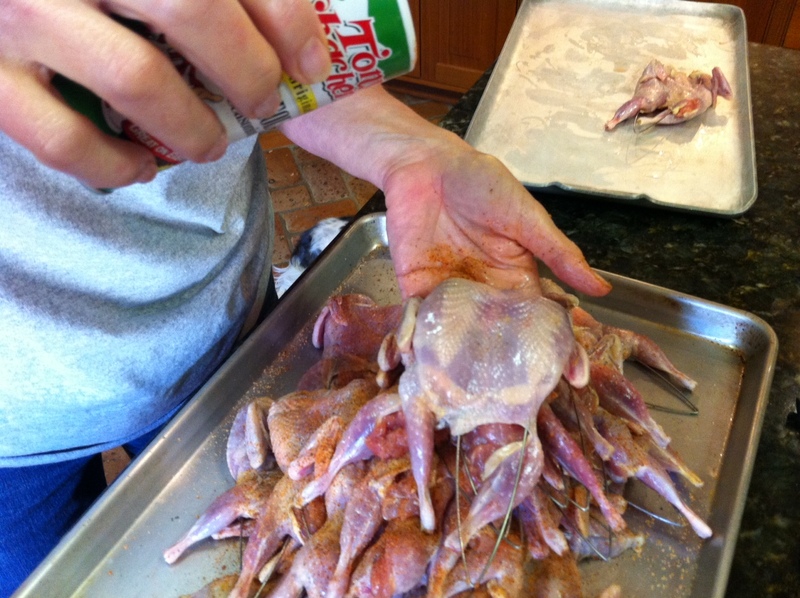 Be careful when removing the quail from the dutch oven, as it will be tender and want to fall apart. Serve with stone-ground parmesan grits (made with heavy whipping cream, duh) or white rice. You just soaked your meat in butter and gravy for an hour. This is not the time to start watching your waistline, my friends. Season the quail with the Tony Chachere’s. Set aside. Heat the oil and 2 tablespoons of the butter in a large cast iron dutch oven over medium heat. Combine ¾ cup of the flour with the paprika, nutmeg, black peper and thyme in a shallow dish and dredge the quail in the flour mixture. Fry the quail in the dutch oven until they are golden brown, turning them to cook evenly, about 12 minutes total. Remove the quail from the skillet and set aside. Add the remaining 8 tablespoons butter (1 stick) to the pan drippings in the dutch oven. Add the onion, celery and carrots and cook, stirring, until they are soft, about 5 minutes. Sprinkle the remaining 6 tablespoons flour over the mixture and stir until the mixture has browned, about 15 minutes. Gradually stir in the broth and continue stirring until the mixture is smooth. Add the wine and simmer, whisking, over low heat for 5 minutes. Add the quail and cover the dutch oven. Simmer over low heat until the birds are very tender, about 45 minutes – 1 hour. Hmm…I happen to have polenta with parmesan that I made last night in the fridge and some quail I, I mean my husband, just shot! Have you done this w wild quail? Does cooking for 45 minutes make them tender enough (legs too)? Hmmm, I’ve never tried it with wild quail. I know they’re a little tougher, so an extra 20 min would probably help.